Knopf Books for Young Readers, 9780553534979, 32pp. 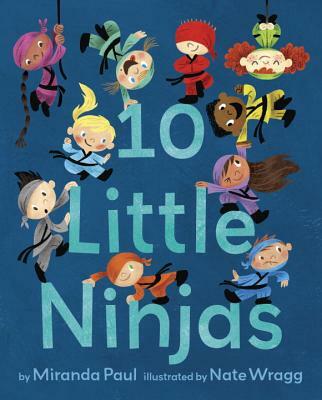 A charming bedtime counting book about ten sneaky little characters who aren’t ready to go to sleep... until daddy calls the sensei to send them back to bed. Miranda Paul's is the author of the picture books One Plastic Bag: Isatou Ceesay and the Recycling Women of the Gambia, and Water is Water. She is the Executive VP of Outreach for We Need Diverse BooksTM (www.diversebooks.org) and the administrator of RateYourStory.org, a site for aspiring writers. Learn more at www.mirandapaul.com. Nate Wragg is the illustrator of Too Many Cooks by Margaret McNamara, Goldi Rocks by Corey Rosen Schwartz and Beth Coulton, and At the Old Haunted House by Helen Ketteman, among others. Nate lives in Southern California with his beautiful wife and their wonderful daughter. You can visit him online at www.n8wragg.blogspot.com.